Over the past two weeks, we've asked listeners to tell us who their favorite Alabama football player is and why. We ended up with more than a hundred calls, tweets, and Facebook comments and that helped us narrow it down to 32 of the greatest players to ever wear a Crimson Tide uniform, and now, we finally have a winner. The one and only, Joe Namath! Namath had a difficult road to reach the championship, taking on Tommy Wilcox, John Hannah, Amari Cooper, and Julio Jones before besting Derrick Thomas in the championship round, 65.33% to 34.67%. It's been a fun ride pitting your favorite Alabama players up against each other in a battle of popularity and greatness. 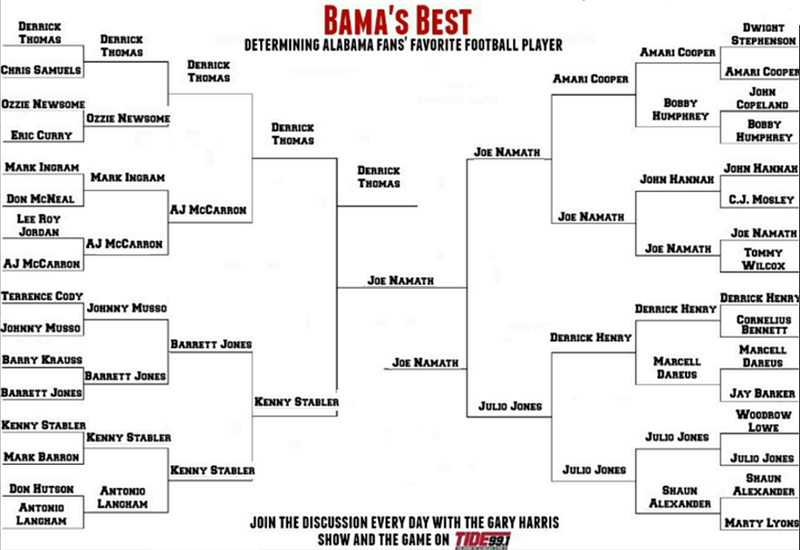 Deciding between two Alabama greats may be blasphemous to some, but it had to be done, and we appreciate your involvement in selecting Bama's Best, Alabama Fans' Favorite Football Player.